The second vessel bringing in steel fabrications for the new footbridge being built at the Broomielaw arrived from Invergordon at the 'Bravo' anchorage on Saturday evening. 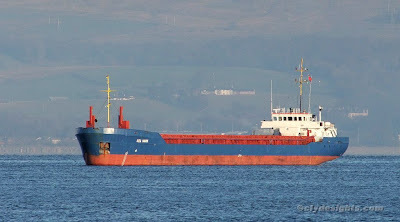 SEA HAWK weighed anchor on Sunday morning with the intent of heading upriver, but it was decided instead to await an improvement in visibility and she anchored again off Greenock. SEA HAWK is operated by Torbulk, and is registered in Barbados. She was completed as MINDFUL in 1989 by the Damen Shipyard at Gorinchem, changing her name to CHRISTA K ten years later. The 3,015 tonne deadweight, 87.7 metre long ship was given her present name in 2006. Wondered why she was so far upriver, Ta ! !